A great chopper is not built but created. It begins as the seed of an idea germinating in the mind of it creator. Bit by bit, the builder brings the machine to life, raking and stretching the frame, fabricating fenders and a gas tank, applying exquisite paint, sculpting something that lives and breathes on its own. Choppers, one of the most enduring symbols from the 1960s, are more prevalent than ever. 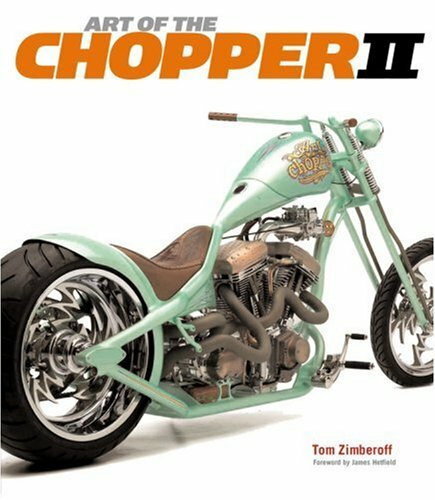 Art of the Chopper profiled twenty of today's top chopper builders and through an extensive color photo gallery of each builder's creations, author and photographer Tom Zimberoff provides an in-depth analysis of that builder's design philosophies and unique style. ART OF THE CHOPPER II profiles 21 more builders and artists, inculding the legendary Indian Larry, one of the originators of the art form, Ron Finch, and auteurs such as Gard Hollinger, and non-professionals such as Staten Island's own Mike Pugliese. A foreword by chopper builder and afficionado, Metallica lead man James Hetfield, also accompanies an engaging text and almost 600 images.ART OF THE CHOPPER II celebrates these timeless machines and the artists who build them. Tom Zimberoff began his career in rock 'n roll photography, touring with groups such as the Jackson Five, Stevie Wonder and the Rolling Stones. His photojournalism appears in magazines and his portraits can be found in the National Portrait Gallery as well as galleries across America.